June 17, 2018. Riga, Latvia – By the time His Holiness was ready to leave for the Skonto Hall this morning, almost two hundred people filled the hotel lobby waiting to catch a glimpse of him. Many held photos and other items they hoped to have blessed. Security personnel had a tough time keeping a cordon around His Holiness as eager and determined devotees pushed from both sides in their efforts to touch him. Once he had reached the teaching venue and settled into his seat on the stage, His Holiness began by remarking that the Buddha taught us to subdue our minds. His Holiness emphasized that prayer by itself is not sufficient to bring about peace of mind. What is much more effective is coming to understand the workings of the mind and learning how to tackle the mental afflictions that disturb it. His Holiness advised the audience to read Shantideva’s ‘Guide to the Bodhisattva’s Way of Life’, paying particular attention to Chapter Six that deals with patience, Chapter Eight that focuses of exchanging self and others and cultivating the awakening mind of bodhichitta, and Chapter Nine about wisdom. Once again His Holiness ate lunch with a group of invited guests following which he held a meeting with the Indian Ambassador to Sweden & Latvia. Before leaving for his hotel, His Holiness met with approximately 75 Tibetans who had come from several European countries to attend the teachings. He mentioned the importance of studying Buddhism and the key role understanding Tibetan has in this. He told them he felt the Tibetan Buddhist tradition would be of spiritual benefit to China in the future. He also briefly alluded to his commitment to the Middle Way Approach—according to which Tibet would not seek independence, but remain within the People’s Republic of China—as part of a mutually beneficial solution. 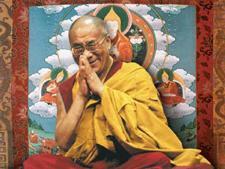 Finally, His Holiness encouraged the Tibetans to be happy and to be proud of their heritage. He told the younger members of the group not to lose hope of one day returning to Tibet. In the meantime, he told them it was important to study modern subjects such as science and technology to be able to contribute to the future development of their homeland.